This is SKYRACK 67, dated. 5th May 1964 and published by Ron Bennett, 17 Newcastle Road, Wavertree, Liverpool 15, England. 6d per copy. 2/6d for 6 issues.35 for 6 issues in the USA(700 for six issues sent airmail) where subscriptions may be paid to Sky's new representative, Bob Coulson (yes, he thanks everyone who asked and says that he is recovering slowly), Route 3, Wabash, Indiana 46992. News of interest to fans always welcomed. Publicity illo over there by Hollywood FAPAn, William Rotsler and contributions by Ella Parker, Ken Slater, George Locke, Bruce Burn, Joe Navin, Alan Rispin, Ethel Lindsay, etc etc. TAFF: There is less than a month to go in the current TAFF campaign between Phil Rogers and Arthur "Atom" Thomson. As much as I admire Phil and appreciate the great service he has given to fandom (1962 Harrogate Programme Chairman, 1963-64 Chairman of the BSFA etc etc), I am firmly behind Arthur, who is probably the greatest personality per se in the realm of fanzine fandom. But.... whichever way you prefer to vote, do just that --- VOTE!!! Voting forms, information etc, are obtainable from either Ron Ellik, 1825 Greenfield, Los Angeles, Calif. 90025, USA or from everyone's sister, Ethel Lindsay, whose address is given elsewhere. Latest donations to the British TAFF treasury have been Walt Willis, Madeleine Willis, Jill Adams, D.G.Small - 10/- each; Joe Navin, Arthur Thomson, Bob Shaw, Betty Peters, Ian Poters, James White, Ian McAulay, Eric Bentcliffe, Wendy Freeman, Keith Freeman - 5/- each. IPSO donated £17. Ken Cheslin sent 16/-and the PeterCon Hum & Sway session organised by Ted Tubb and Ken Bulmer realised £2.14/-, to bring the total up to over £113. U.S.A. TAFF DELEGATE Wally Wastebasket Weber left the con with Terry & Val Jeeves, later visiting Eric & Beryl Bentcliffe and Ken Cheslin who was supported by a large Midland gathering. Wally then came on to Liverpool, taking in a football match and a ten pin bowling session (yes, Wally won - easily!). From there it was down to London, where he and Ella Parker both produced a random Cry and were taken gliding by SFCoL expert George Locke. Wally left London 16 April @ 1.30pm, arriving in Seattle, according to Starspinkle ten minutes later @ 1.40pm. Sheesh! Roll on the '65 London Worldcon when we can have him back with us. ALIEN 8 (April 1964; Harry Nadler, 5 South Mesnefield Road, Lower Kersal, Salford 7, Lancs; 1/-) Devoted chiefly to fiction and articles on monster fandom. Tony Edwards writes a factual science article, Harry Nadler re-lives filming experiences and Clive Fowkes reviews Children of the Damned from which film are included a quartet of stills. I like the slick, contained approach of Alien but it possesses in the main a specialised appeal which does not truly mesh with my own. A CHILD'S GARDEN OF OLAF (Easter 1964; Mike Higgs, 138 Barrows Road, Spark­hill, Birmingham) 60 cartoons featuring Viking Olaf from fandom's latest artistic acquisition. The hurried execution (publication in time for the PeterCon) shows through in places, particularly in grammatical errors in captioning. Olaf would have made more impact, I feel, had he been introduced gradually, spread out over several genzine appearances; as things stand, he strikes one as a poor fan's Andy Capp, in omnibus form. A pity, for artist "Mik" deserves better treatment. From the same source comes a slim foolscap The Miktoon Pamphlet. NADIR 2 (March-April 1964; Charles Winstone, 71 George-Road-, Erdington, Birmingham 23) Slim personal fanzine, with limited circulation. THE KENCON (Peter Weston, address elsewhere) 6 page, oneshot covering Wally Wastebasket Weber's wild Worcester weekend. SCIENCE FICTION ADVENTURES - a checklist (Roger Peyton, 77 Grayswood Park Road, Birmingham 32) An excellently produced coverage of SFA BRE's. No price stated, unfortunately. E.C. TUBB - AN EVALUATION (Philip Harbottle, 27 Cheshire Gardens, Wallsend-on-Tyne, Northumberland; 1/6) Article on this year's Convention GoH, a checklist of novels, a pen name listing and a little artwork thrown in for good measure. Not quite as thorough as the compiler's previous project, on J.R. Fearn, but still highly recommended. SCENE 1 (Arthur Thomson, 17 Brockham House, Brockham Drive, London SW 2) 1st issue of the SFCoL's new monthly newszine, being concerned primarily with plugging the 1965 London WorldCon (As though it needs plugging. 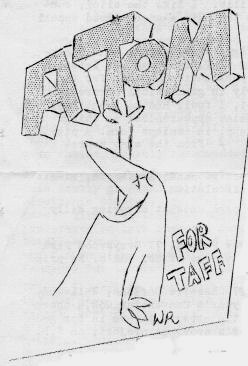 It's almost as pointless as saying "Atom for TAFF" - sit down, Alan Shorrock). This first sheet is notable for an excellent one page write up of the Griglin. A NOTE FOR THE NEW WAVE. Any fanzine is protected by international copyright under the 1891 Act if it is lodged with the British Museum. Skyrack is so copyrighted. Whilst there is no copyright on facts themselves, when any facts are reproduced after having been gleaned from Skyrack a note to that effect would be appreciated. Items in Skyrack are not to be reprinted unless specific permission is given. This does not apply to Starspinkle and Science Fiction Review who may take items from Skyrack and use them as the editors think fit. Well now, Charles Platt? CONGRATULATIONS, CONGRATULATIONS and CONGRATULATIONS. Engaged this past month are Dave Hale and Margaret Thompson, Brian Jordan and Barbary Coast Callard, and Bruce Burn and Eileen Lyster. VECTOR 25 (March 1964; Official organ of the BSFA, edited for the last time by Archie Mercer and published, also for the last time, by Michael Rosenblum, to whom all fandom is grateful for a well done job during the past year). This all star issue is a little disappointing in that, whilst the items in this issue are quite good, they are no better than recent articles by non-star names. For collectors, the names concerned are Ted Tubb, Eric Frank Russell and Harry Harrison. Jean Graman slips in with a piece on Russian sf and there are letters and the usual departments. HYPHEN 35 (April 1964;Walt and Madeleine - not only do I mention you at times dear lady, but I also take the trouble to spell your name correctly - Willis at 170 Upper Newtownards Road, Belfast 4, N.Ireland; l/- or 15c) American quarto again which naturally signifies another installment of the WTAF Stateside trip. There's 10 pages of it this time, a BoSh Glass Bushel, letters and the back cover quotes. Merely recommended in an offhand manner as a 100% must. ZENITH 4 (Peter Weston, 9 Porlock Crescent, Birmingham 31; 1/-) Highlight of this neatly produced April-May issue is the range of artwork reproduced by electronic stencil, the Finlay illustration being particularly worthy of note. Alan Dodd looks at Russian aliens, H. Beam Piper makes a surprise appearance to look into the future, John Berry writes a story, Philip Harbottle surveys the sf art of prewar days and there are departments on books and fanzines (including a short bibliography of Corgi sf). Not the best of fanzines but invaluable for its book news. CRY 173 ½ (April 1964; Wally Weber, Box 92,507 3rd Ave, Seattle, Washington 98104, USA) Produced while Wally was incarcerated at the Parker Penitentiary, about 50% a hoax issue and about 50% genuine for-the-sheer-fun-of-it contributions. The sort of spontaneous ebullience that makes fandom worthwhile. LES SPINGE 13 (May 1964; Dave Hale & Ken Cheslin, 12 Belmont Rd., Wollescote, Stourbridge, Worcs this issue 2/3d) A high price, but with 100 pages packed with assorted goodies, who can squawk? Dave reminds me that in my last LS review I mentioned that it would be difficult to improve on LS 12. This latest melange is decidedly better in its overall standard of writing and of course there is a deal more of it this time. Ken Cheslin contributes a better, more restrained, column, Walt Willis recalls "A Day in San Francisco with Ethel" (the best fanzine article I've read in some four or five years), George Locke recalls Fred Hunter's visit to London, Mike Moorcook reviews books and films, Colin Freeman escapes from Stefantasy, Alan Burns writes on punishment, Sheila Barnes is brainwashed by Ella Parker, Archie Mercer goes coy, Charles Smith conreports, John Berry fictionalises, Jim Linwood tears off his rose coloured glasses.... etc etc. (One of the etcetera is a brilliantly factual piece by Ian Peters on the North American Indian) and there is artwork by Cawthorn, Jones, Thomson, oh, even Bill Harry. Decidedly a superb issue, and dare I say it? -- how are you going to improve on this one? Richard Mann, 131 Belt Road, APO 845, New York, New York 09845, U.S.A.
SNIPPETS: Last with the news, in all probability! Skyrack will not be rushing to print the TAFF results on 1st June. This breaks a long tradition, but while I consider fandom a way of life, exams are a living death and I have a series of finals to look forward to June 3-6. Accordingly, it doesn't matter if the BSFA Library falls on you - there won't be another Skyrack until after 6th June! ::: Bruce Burn marries 30th May in Tauranga - many thanks for the invitation ::: Sheffield party 11th April to celebrate the engagement of 1961 MiniCon planner, Brian Jordan, attended by Alan Rispin, Val & Terry Jeeves, Chris & Jennifer Miller ::: Hugo nominations are closed. Amongst the names and stories listed amongst the final nominees are British prozine Science-Fantasy, fanzines Amra, ERBdom, Yandro and Starspinkle. Nominated amongst the novels is, of all things, Glory Road::: Doss in the Schloss. Latest probable attendees for the Marquartstein August Castle Con are Simone & Tony Walsh and Swedish fan Sam Lundwall ::: Swedish issue of FANAC no. 6 in from "Carl Brandon." ::: Allen & Unwin publish Tolkien’s Tree & Leaf on 28th May. Cloth bound @ 10/6 or paperbacked @ 5/-. Contains an essay on Fairy Stories and "a strange, original tale" called Leaf by Niggle ::: Ken Slater reports that Bruce Montgomery spent an interesting two seconds on Easter Sunday breaking his arm ::: Rugby School has formed a Fantasy & S.F. Society. President is Peter Alderson Smith, Jettyfields, Braunston, Nr.Rugby ::: Sunday Times 19 April ran verse by R.M.Bennett. This R.M.B. is not guilty ::: New Worlds SF 142, the first under the Moorcock administration due anytime, pocket book format, and @ a reduced cost of 2/6d ::: International Apa being formed by Kris Carey, 1016 - 2nd St., Wasco, Calif 93280 ::: N3F Short Story contest winner, The Ticket by Frances Hall, bought by Pohl for July If ::: Allan Lerner (MFL and Camelot) writing $5 million film musical based on Dr Dolittle ::: TV:Hitchcock show 12 March featured Bradbury's The Jar, Detective 30 March ran Crispin's Moving Toyshop featuring Richard "Victor Carroon" Wordsworth as Gervase Fen, Dr.Who is still time travelling and in The Outer Limits programme of 23rd April, It Crawled Out of The Woodwork(Voordwork?) by Psycho screenplay writer Joe Stefano, the villain was called Bloch ::: S.E. Essex Technical College recently banned Village of the Damned.